"Yanks, Come Back!" Those are strange words to be seen on a banner being waved by a group of demonstrators. But the plea is not so farfetched to at least some French citizens of New Caledonia. This traditionally serene South Pacific island, situated off the northeast coast of Australia, is a remnant of France's colonial past. Renowned primarily for its rich nickel deposits and enticing beaches, New Caledonia is home to some 140,000 residents. Now civil war between pro- and anti-independence forces looms as a distinct possibility. The original Melanesians, called Kanaks, constitute 43 percent of the population. It is from their ranks that most of the pro-independence activists come. Opposing them are the bulk of 52,000 French settlers and a minority of Asians and Pacific islanders who wish to remain under the flag of France. Increasing tensions have caused tourism to drop. The island has become an armed camp in many areas, and violent clashes have taken their toll on human lives and property. President Mitterrand of France proposed a referendum on autonomy for 1989. The separatists, however, clamor to have it earlier, perhaps in 1986; parliamentary elections are due in France in 1986, and they fear a conservative swing could make independence harder to achieve. The separatists' National Liberation Front has already set up its own provisional government. Many French settlers accuse Paris of planning to abandon its children. They want no part of independence. Washington, while leaving hands off, has its eyes on the situation. More than rhetoric is involved in claims that "foreign powers" are behind the scenes, stirring things up. Libya's Muammar Kadafi last year proclaimed that it is time to "liberate the French colonies," and he played host to leaders of the New Caledonian independence movement. Independence for New Caledonia could help pro-independence moves elsewhere in the South Pacific, as well as in the French West Indies. A New Caledonia "in the wrong hands," some say, would be destabilizing. As a prominent French weekly put it, "Neither Australia nor New Zealand has any desire today to have a Cuba at their' doorsteps." Advanced color photocopiers will be in use in sufficient numbers in the next two years to pose a serious threat to U.S. currency. Already, U.S. currency is the most counterfeited in the world. Other countries have redesigned their currencies to meet a similar problem. Canada and England reduced levels of counterfeiting after converting from single-color to multicolor notes, according to Joseph Sheldrick of Battelle Columbus Laboratories, which was commissioned to study deterrents to copier counterfeiting. Last year in England a new 20-pound note was issued. A security thread appears as a line of silver dashes down the front of the bill; when held up to light it appears continuous. Last November, Japan changed its currency, already among the hardest to counterfeit, by introducing a special ink and increasing the number of lines in portraits. The United States, with one of the few remaining one-color currencies, is also considering changes, among them pastel colors, security threads and optically variable devices. Optically variable devices such as holograms, in use now on some credit cards, would create shifting images as viewed when the bill is moved. But they are too expensive and "we're not that sure of the technology yet," Robert J. Leuver, director of the U.S. Bureau of Engraving and Printing, told The Plain Truth. But will counterfeiting cease when these deterrents are used? According to Mr. Sheldrick: "The professional criminal will put forth additional efforts to compromise the deterrents, and it has been demonstrated that given enough time and money, methods are available to compromise essentially all of these deterrents." Chile's March 3 earthquake, one of the most intense in the nation's history, also could well turn out to be the most expensive. Original government estimates of damages were US $538 million. But later the government trebled the figures. The severe quake caused damages requiring replacement of 200,000 homes plus damages to numerous public buildings, schools, hospitals, water and sewage works, roads, ports, transport and telecommunications, power supplies, mining and agriculture. Since 1900 Chile has suffered 150 tremors of 6.5 or more on the Richter scale (powerful enough to do serious damage to buildings and human structures), with 300,000 deaths. The March quake added a heavy burden to a nation already struggling to overcome severe economic difficulties. Many industries were apparently lulled into a sense of false security by the unusual lapse between major earthquakes. Since the 1940s, Chile had suffered at least one such catastrophe during each six-year presidential term. General Augusto Pinochet Ugarte had ruled for more than 11 years without a major quake The disaster again showed the dramatic impact earthquakes have on 20th-century civilization. 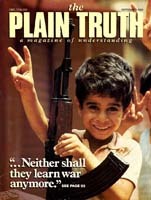 Personal reactions to the Chilean trauma are reported in this issue of The Plain Truth. Drug abuse has reached unprecedented proportions worldwide, even threatening the security of some nations, according to the annual report of the International Narcotics Control Board. Illicit production, trafficking and the abuse of drugs — legal and illegal — now affects record numbers of people. • The situation in Western Europe is "grim and deteriorating," with heroin use in particular "a major public health problem." Britain, West Germany and Italy reported the largest amounts of heroin seized last year, while the Netherlands, France and Belgium were also gravely affected. Cocaine is also "a major drug of abuse," with large amounts seized in Spain, Belgium, France and West Germany. Amphetamine misuse is greatest in Scandinavia. • In Canada, "Abuse and illicit traffic in drugs constitute serious and growing concerns. Cannabis and its derivatives remain the most extensively abused.. Cocaine is increasingly becoming the second drug of abuse. • Drug production, especially cocaine; and trafficking continue to expand in Latin America and the Caribbean. • The Middle East "remains a major source of opiates for the international illicit traffic. Over one half of the heroin seized in North America and around 70 percent seized in Western Europe during the first seven months of 1984 originate in the Near and Middle East." • Traffickers in economically depressed areas of Africa have put that continent "at great risk." • Countries such as Brazil have been transformed from transit routes into cocaine production centers. While drug abuse remains a serious problem in the United States, overall percentages of current and new abusers seem to be leveling off within some age groups. According to a University of Michigan survey, there is a growing aversion to marijuana, Cigarettes and alcohol among high-school seniors, while the level of cocaine use has not changed since 1979 among that group. The World Health Organization estimates that there are some 48 million drug abusers worldwide, and the number is increasing. Despite the widespread belief that smoking marijuana is harmless, if not helpful, scientific research is proving quite the opposite. "Smoking one marijuana joint is probably equal to smoking a pack of cigarettes a day," says Dr. Alfred Munzer, a member of the Board of Directors of the American Lung Association. Laboratory tests show that marijuana smoke contains about 50 percent more cancer-causing substances than cigarette smoke. Because marijuana smokers inhale more deeply, burn as much of the joint as possible and do not use filters, the deleterious effects are multiplied. A friend of Italian dictator Benito Mussolini once commented that Italy must be difficult to govern. "It is not difficult," replied Mussolini. "It is impossible." Part of the difficulty the Italian government faces is how to deal with tax dodgers. The trouble is that avoiding one's taxes is seen by many as one more necessary duty in l'arte di arrangiarsi — the art of getting by. Finance Minister Bruno Visentini is armed with a battery of computers to identify the country's millions who refuse to pay their share of taxes. Behind him stand Italy's trade unions and hourly wage earners who are unable to avoid taxes because of payroll deductions. Shopkeepers and salaried workers are the main targets for investigation. According to government reports, the average shopkeeper declares an annual income less than that of his employees. Professionals and other salaried workers often report similarly "poor incomes." Mr. Visentini plans to curtail what is seen as massive fraud by closing tax loopholes. Opposition to the finance minister is significant, however. Some even fear that the Craxi government could collapse over the issue. But the socialist government feels something must be done to spread the burden of Italy's generous welfare system evenly and fairly among all taxpayers. And it is the fairness issue that has divided the nation's business and working classes. In Italy, the unemployed can receive 80 percent of their income in a welfare system increasingly financed by the wage earners. Yet businessmen complain that obeying the law would greatly increase their costs.